"For most conspicuous bravery during the operations in the Southern Zone of the Gallipoli Peninsula. On the 28th June 1915, when a portion of a Regiment had been checked owing to all the Officers being put out of action, Second Lieutenant James, who belonged to a neighbouring unit, entirely on his own initiative gathered together a body of men and led them forward under heavy shell and rifle fire. He then returned, organised a second party, and again advanced. His gallant example put fresh life into the attack. On the 3rd July, in the same locality, Second Lieutenant James headed a party of bomb throwers up a Turkish communication trench, and, after nearly all his bomb throwers had been killed or wounded, he remained alone at the head of the trench and kept back the enemy single-handed till a barrier had been built behind him and the trench secured. He was throughout exposed to a murderous fire." 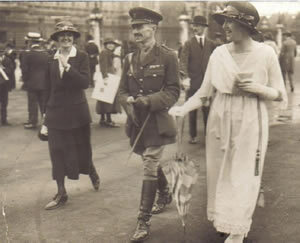 Herbert James was invested with his Victoria Cross by King George V at Buckingham Palace on the 15th January, 1916. 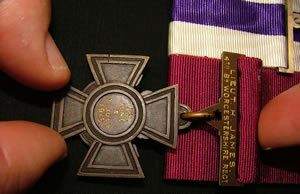 Medals: Victoria Cross; Military Cross; 1914/15 Star; British War Medal; Victory Medal with Mentioned in Dispatches emblem; Coronation Medal GVI – 1937; Coronation Medal EIIR – 1953; French Croix de Guerre with palm; Panama Medal De La Solidaridad 1917. "During an attack, he rode forward when the situation was obscure under heavy fire, and brought back most valuable information. He then reorganised and led forward parties of men from other units and skilfully formed a defensive flank where a gap had occurred, exposing himself for many hours to a very heavy fire. By his gallantry, coolness, and utter disregard of personal safety, he set a splendid example to all ranks." By the mid-1950s James was separated from his second wife and renting a back room flat at Brunswick Gardens, Kensington, apparently making a living as a fine art dealer. It was here in August 1958 that he was found by his landlord lying unconcious – it appeared that he had a seizure but remained undiscovered for six days. None of his fellow residents had any idea he was a Victoria Cross recipient, for James lived a very reclusive life, had no visitors nor took any telephone calls. It was only when the landlord returned to James' room, after the ambulance had departed, that he picked up a book of a complete list of VC recipients open to the page against Major James' name, under which was a pencil line. That was the first he new that Herbert James was the holder of the Victoria Cross.